Sales are not yet running smoothly in the top-fruit market. "We are doing reasonable business, but it remains an uphill battle. 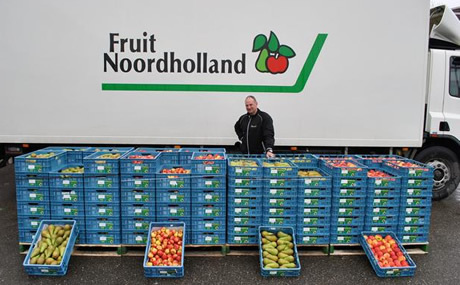 If you want to put your prices up a few cents, you are quickly considered to be too expensive", says Erik Kieftenburg of the Dutch company, Fruit Noordholland. "The automated cells are, however, now just about empty. We are currently getting fruit from the ULO cells. A certain price has to be paid for that." "Early this week, the trade came alive again. Last week it was a bit quiet", says the top fruit trader. He mainly sells his wares on the Dutch and German markets. "Demand for Gieser Wildeman is now beginning to increase. Good Elstars also get good money. I have, however, found that the Jonagold and Conference are lagging. There is simply enough stock of everything. Last year, you could still make a euro on Hollandse Braeburn. Now, the price level is between 50 and 60 cents." "We have no complaints regarding sizes here in North Holland. Growers here were able to irrigate their lands well. This is in contrast to those in the South", continues Erik. "There are, however, some problems with quality here and there. The effects of the hot, dry weather can be seen in cork tip with the Jonagold and Golden." "There are quite a few Conference batches that were picked too late. The last harvest that had to get a move on caused a surplus in the market. The Comice pears also ripened relatively quickly. All in all, it is a matter of paying attention and not building up large stocks", he concludes.